'Land Bank' Knocks Out Some Foreclosure Problems The housing crisis has left banks stuck with crumbling, foreclosed houses that they can't resell. In Cleveland, a quasi-government corporation takes over those houses, and the lenders pay to demolish them. The idea may soon take hold in other cities as well. 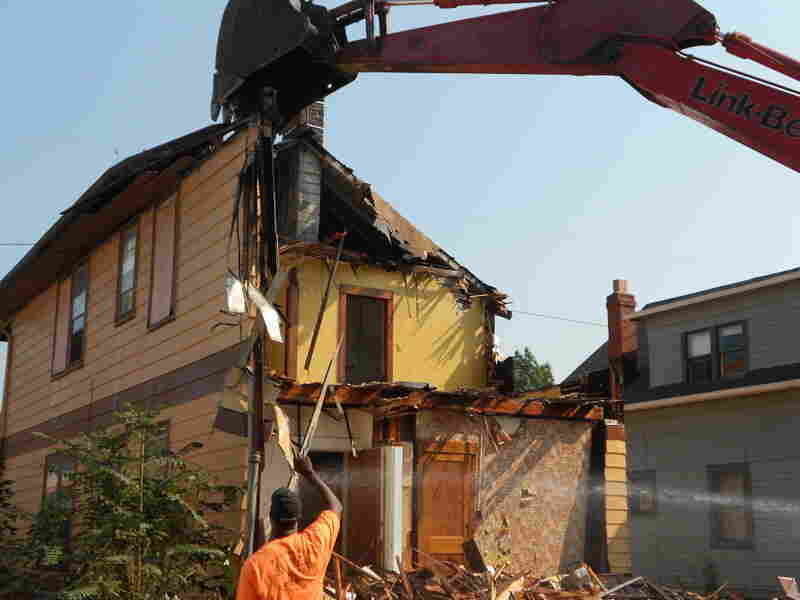 LaMont Rump of Fez Enterprises guides an excavator during the demolition of a house in Cleveland. Bill Beavers has lived on Cleveland's Dove Street since 1967. But on a recent sunny morning, Beavers is sitting on a neighbor's front porch, watching something he has never seen on his block before. "Oh, it's good to see them tear these old structures down because nobody wants to move in them," Beavers says. "It costs too much to fix them up, you know?" Saturated with foreclosures, the lender that took back the house couldn't unload it for even $5,000. "A property like that, on a street that's otherwise relatively stable but [in a] depressed market, probably needs to come down because it has way too much need on the inside," says Gus Frangos, head of the Cuyahoga County Land Bank, which oversees these demolitions. "If you take these pockmarks out, all of a sudden you stabilize the street a little bit." The Cuyahoga County Land Bank, a quasi-government corporation, offered lenders a deal: We'll take your worst houses, if you pay to knock them down. This year, Fannie Mae and some of the country's biggest lenders — including Bank of America, Citibank and Wells Fargo — will help pay for half of the land bank's 700 scheduled demolitions. Lenders pay $3,500 to $7,500 per house. Wells Fargo's Russ Cross says it's a sensible and responsible business plan. "We want to make loans on an ongoing basis, and to do so, we need stable to rising home values," he says. "We've got to do whatever we can to protect home values in neighborhoods." Some lenders are looking at starting similar programs in Detroit, Chicago and Milwaukee. Fannie Mae's P.J. McCarthy says the government-controlled mortgage giant has been donating properties and demolition funds to the Cuyahoga County Land Bank since 2009 because keeping the houses just doesn't make sense. 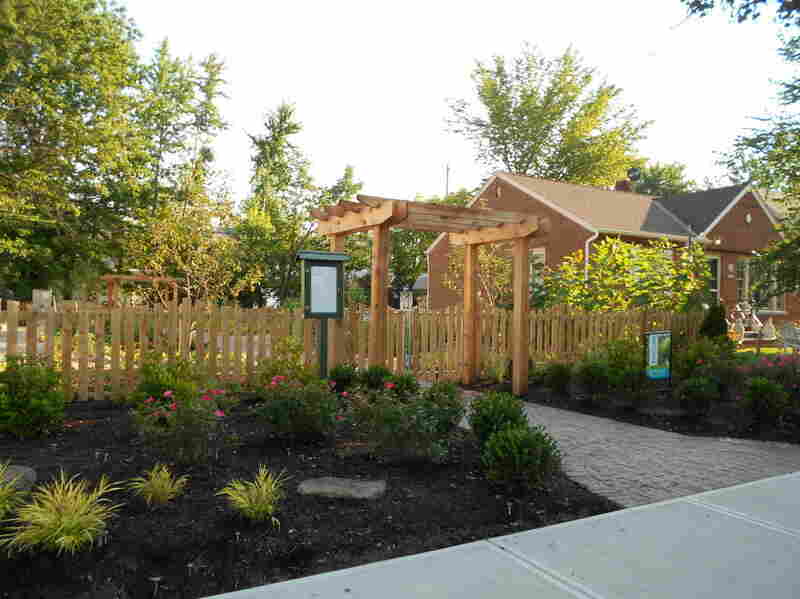 A newly erected community garden in the Cleveland suburb of South Euclid grows where there was once a dilapidated, foreclosed house. "They are not going to sell on the market for much more than a few thousand dollars, and our costs in marketing those properties and preserving them generally exceed the costs," he says. "So the economics of the transaction make sense as well as the intent of the land bank to reduce supply and stabilize the neighborhood." RealtyTrac's Rick Sharga says demolition programs like Cleveland's only start to address the backlog. "Eliminating a handful of these houses really isn't going to be a cure-all in and of itself," he says. "It's one step in a much longer process that's going to be required before the housing market comes back." "The house was so far gone, we couldn't fix it up and get any kind of a return, so we demolished the house, and we put in this community garden," he says. "And it's now become a source of community pride."